Alberta’s only family run dairy offering both goat milk and Organic Jersey milk products!The Bos family have a long-standing foothold in the farming business, giving them the heart and soul to grow a successful, ethical dairy operation. Patrick and Cherylynn Bos began their chapter of farming immediately after being married at the young age of 22. Both loved farming and all that went with it: the work, land, animals and space. They wanted a farming lifestyle for themselves and their future family, Patrick’s parents were very supportive as they tried to work out the farm finances and change the farm in ways to suit their personal goals. Patrick and Cherylynn purchased their first milking goats in 1999 and began milking for a Ponoka-based processing company. In 2004, the plant closed. As a result, the Bos’s decided to take control of their own future, and built a goat milk and cheese processing facility on the farm property. In 2012, the Bos’s took another big step and upgraded their facility and equipment to allow for the production of organic cow’s milk and creams. Now teamed up with Arnold Van Os and his families Organic Jersey cow farm they are pleased to be able to supply Alberta families with a lineup of Organic Jersey cow milk and goat milk and cheese products. These products are rich in A2 Beta Caseins and gentle on your body allowing many dairy sensitive individuals the joy of dairy again. 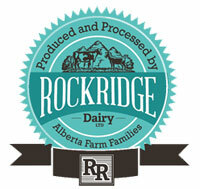 The Organic Box is proud to have Rock Ridge Dairy as one of our producers.